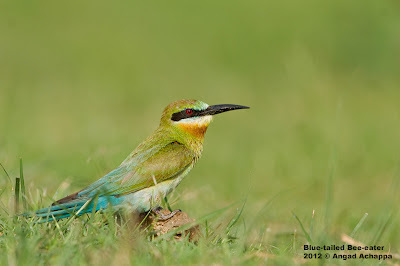 So here are a few images of Blue-tailed Bee-eaters i made in the month of May. Hope you enjoy them. All the images were shot on a Canon EOS 20D with a Canon EF 600mm F4 L IS USM lens using rear-focus AF. A pair of Blue-tailed Bee-eaters on the ground. 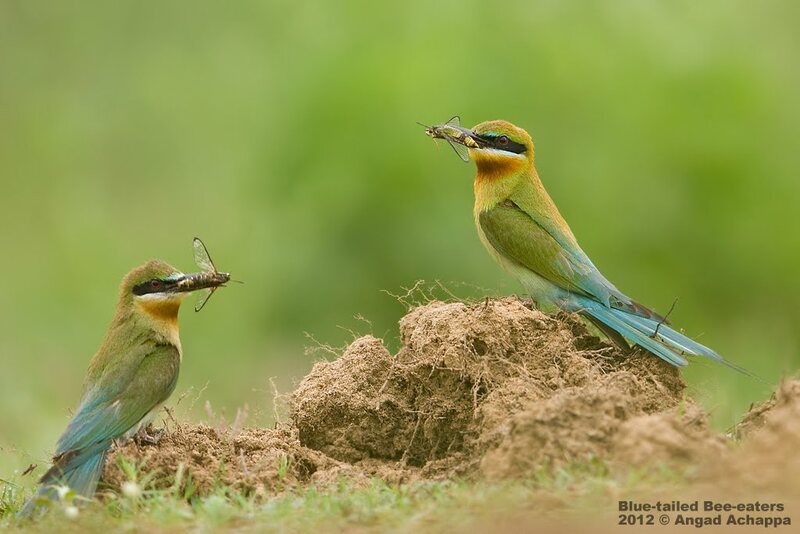 A pair of Blue-tailed Bee-eaters with their catch! 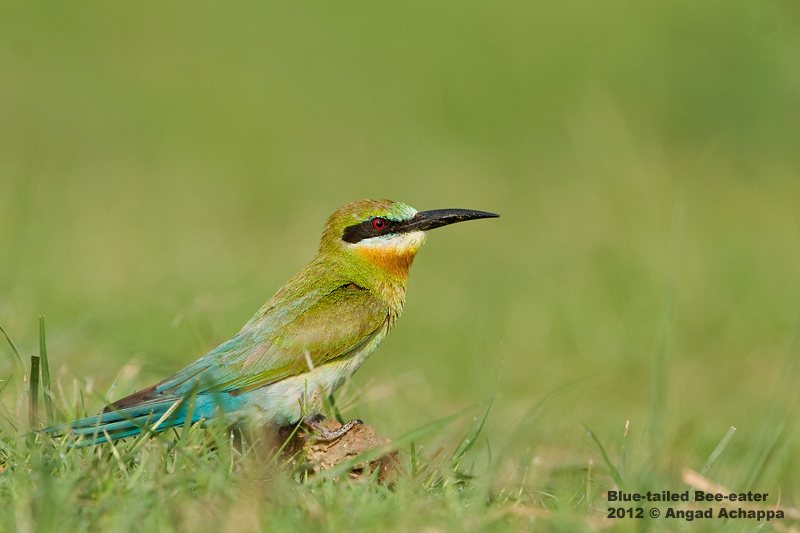 Blue-tailed Bee-eaters are near passerine birds from the Bee-eater family. They breed in South-eastern Asia, and are seen during the season in most places in peninsular India. It is a richly-colored slender bird that can reach lengths of 23-26cms. The body is mainly green with a blue tail, from which it gets its name. Blue-tailed Bee-eaters feed on insects, especially bees, hornets and wasps. They also feed on dragonflies (as seen above) in equal numbers. Quite often they are seen beating the insects cought in their beaks against twigs or branches, this is done to break the insects exoskeleton. They nest in colonys in sandy banks or open flat areas, with the birds laying five-seven eggs each. Both the parents take care of the eggs and chicks. A note to photographers: Please avoid going too close to the nest as this prevent the parents from taking food to the chicks inside the nest. 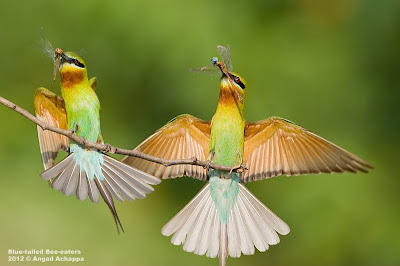 such beautiful images of these gorgeous birds! nice post, angad! Fantastic shots!! I also captured this bird lately but yours are mesmerizing and greater in detail. Thanks for the fact on the bird! Hi Angad, just come across your blog and now following, great images. What a fantastic sequence Angad. I envy you to see so beautiful birds and getting so nice pictures of them behaving. Well done my friend. Wow. what a great photography, you have added here amazing pictures of the birds who make a victim to the dragonflies. Both birds has enjoyed the moment after catching the dragonflies. Very nice photography thanks for sharing. can you please tell me the reason for migration to India... I need it for school project of my daughter.